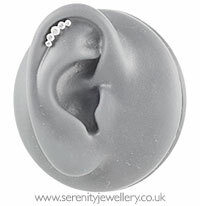 Industrial Strength* Odyssey "Prium" hypoallergenic titanium screw-in end with five prong-set white cubic zirconia Swarovski crystals. 12mm long. The central crystal is 3mm, the next two 2.5mm and the end two 2mm. PLEASE NOTE this item is the screw-in top only not a complete labret. 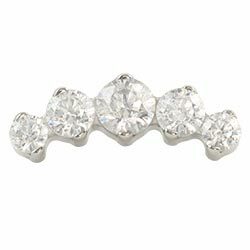 These gems can be used with Industrial Strength titanium labret posts but will not fit any other brand. While titanium is very strong Industrial Strength is a brand name not a description! I absolutely love this is my conch! Perfect jewelerry and fast free shipping! Titanium is one of the safest metals available and is ideal if you are allergic to nickel, silver or gold. Titanium colours are created by anodising which changes the surface colour of the metal without coatings or plating. It is important to remember that the main difference between the grades of titanium we have is mostly in the manufacturing. All are suitable for initial and healed piercings. Read more about tianium grades and metal allergies here.